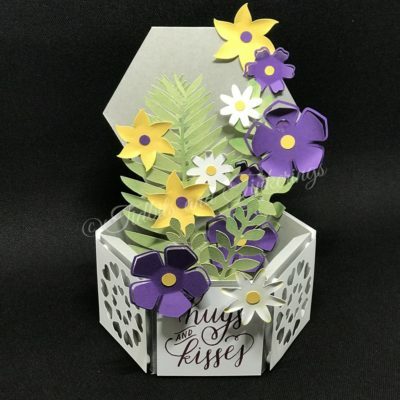 Today I'm sharing this adorable hexagon box card with you all. You can make just the box if you prefer, the file includes 2 different cuts for the box itself, one with the solid lid or one with the heart pattern cutout that you see on the panels in the picture below. I'm also including the greenery and flowers as their own SVG file included in the zip. To see how to assemble for use as the box card pictured you can watch the video on my YouTube channel here. You will need 2 pieces to construct the box itself, a top and a bottom. In the file you will get a piece with a solid top/bottom and also one with heart cutouts, for my box I used 2 of the solid pieces. If you plan to use the box for the floral card as I did then once you bring the box pieces into your design software you will want to add a score line in the center of one of the "lids" from corner to corner so that it will fold in half, that piece will be your bottom and will fold up and work as your insert to attach some of your floral elements to. If you are making the card then you will ONLY attach your 2 pieces together to form the hexagon shape, do not glue down the top or bottom or else your card won't collapse and fold flat. If you plan to use the box as a card you can also trim off all of the tabs except where you attach the 2 pieces together since you won't actually be folding it into a box. For the greenery and flowers I just duplicated and resized elements to get the assortment I wanted for my card and then attached them to the folded up lid on the inside, the back and the front to get an arrangement I liked. I used foam dots on some and others I glued directly down. This is an SVG only file so there is no direct link to a Cricut Design Space project. You can download the SVG file Hexagon Box Card SVG. Inspiration for this card comes from Pinterest. Thank you so much for the svg file. I have been wanting to make one of these boxes for a while. Love your card. Can’t wait to try it. You are so generous to share. Thank you so much for sharing this. Love it!! Thank you for sharing your file. Thank you very much, beautiful.